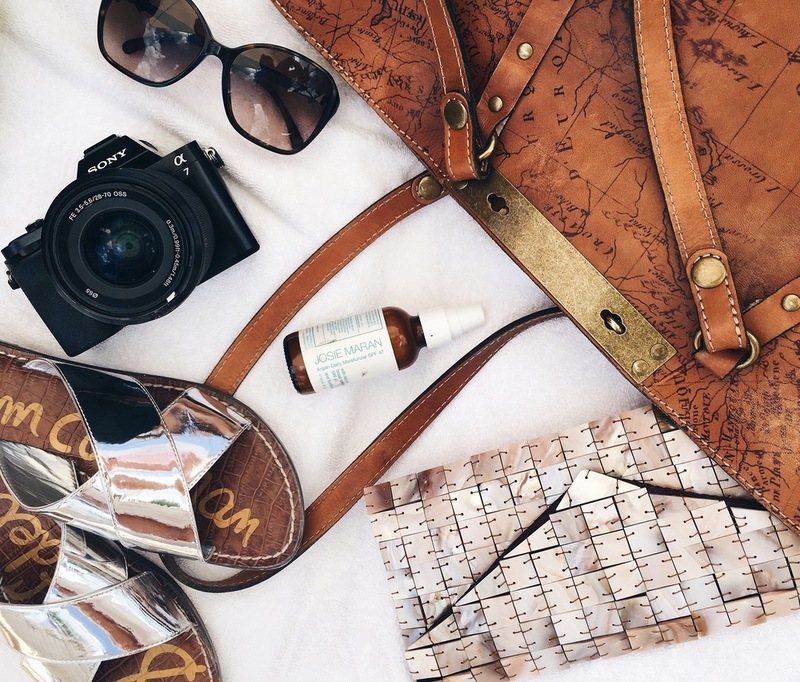 This summer is all about what's in your beach bag! What's in yours? First and foremost, find a beach bag that is big enough for all of your must haves. Obviously when I travel I use my favorite Patricia Nash tote as my beach bag. I like to travel with minimal baggage because honestly I hate luggage and I really hate waiting for it down at baggage claim, pet peeve. So I take my Patricia Nash tote with me along with my carry on, and turn my Patricia Nash into my beach bag when traveling. I mean, the pattern alone screams take me on adventures, with the cool map design and the tote is big enough for all my essentials; a towel, sunglasses, lotions, etc. Get a good, durable beach bag this summer you can take around the world with you. This bag has seen so many different countries! I'm a big believer in simplicity, style and comfort when it comes to beach sandals. I often wear my Bionica sandals or my Isola sandals, but recently I came across a great deal at Marshallas with these bright Sam Edelman sandals for only $19.99! I mean, seriously? You know I'm a sucker for a bargain, I needed to have this Sam Edelman steal. Having a lite, comfy and stylish beach sandal is a must! Josie Maran Argan Daily Moisturizer SPF 47 is my go to when protecting my face from the sun! I have learned through my years of tanning that you must protect your face at ALL times. We don't want any wrinkles showing too early! This super lite moisturizer protects my face and it's small enough to bring in your carry on. Oh and get this, all the ingredients are super natural and chemical free!!! Can you say winning! Protect your beauty with this awesome Josie Maran moisturizer that's super lightweight and non greasy like other sunblocks. Invest in your facial products always. Read more about it here. Ok, so I have a love/hate relationship with sunglasses. I find myself either constantly losing them or breaking them every summer! Is it only me? So I made a rule that I abide by every year. My rule is to splurge on one pair of dope sunglasses until I lose them, because let's face it, it's inevitable. Until I lose or break my bomb sunglasses, I like to buy less expensive sunnies from stores like Nasty Gal or Quay. So my advice, don't splurge on 2-3 high end sunglasses. Splurge on one pair of sunglasses you must have, and collect throw away pairs along the way. So those are my four neccessities I always have with me in my beach bag. I bring along my Sony camera with me whenever I travel, but let's be real I'm still learning how to use this thing so it's not quite a neccessity yet, lol. When I think of the beach, I think recharge, breathe and zen. Take time out of your busy schedule to get by a beach this year. Beach therapy is the best therapy.